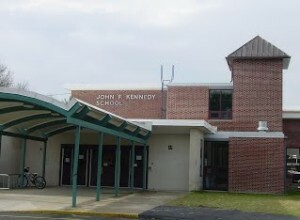 he John F. Kennedy Elementary School presented different opportunities to create two-story accessibility scheme on the exterior of the central entrance lobby. This scheme proved to be the most realistic and efficient scheme. Compared to interior schemes that would necessitate the taking of material storage rooms, or partial classrooms in a school system that had no vacant space to offer. 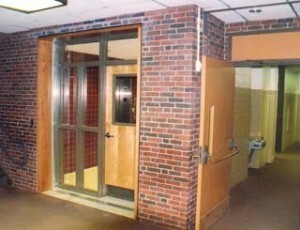 The two-stop elevator was designed on the exterior of the main entrance with adjacent machine room. The final scheme blends the design into the existing architecture. The elevator addition adjacent to the main lobby, maintains harmonious interior appearance, blending with the existing interior design. Choice of ceramic wall finishes were selected by the school and applied on the newly created second floor corridor connector to the main building, Durable stain resistant floor tiles with energy efficient wall insulation, metal thermopane windows, and recessed lighting was included in the preferred scheme. The elevator tower constructed of concrete masonry units with exterior veneer Flemish Bond multi-color brick pattern, overcame hidden ground conditions. Change Orders for hidden conditions did not exceed 2.5% of total construction budget.